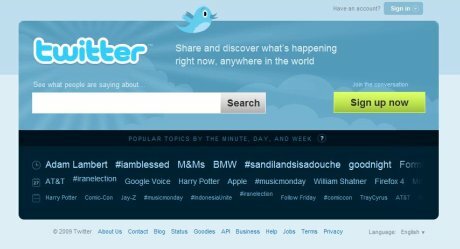 Twitter has launched a revamped version of its homepage, with the aim of emphasising the role of the site as a search tool, and appealing to new visitors. through our search and trends’. There has been talk of Twitter being a search engine, and while most people will go to Google if they want to actually find something, there’s no doubt that Twitter is a useful research tool, especially for journalists and marketers, to monitor real time trends and opinions. The search box also makes sense as a method of attracting new users by showing them a glimpse of what the site is about; they can type in a topic of interest and see if people are talking about it. As well as the prominent search box, topics that are popular right now, from the last 24 hours, or over the last week are displayed underneath the search box. It’s an interesting move, and certainly an improvement on the old homepage. The search function on Twitter has been frustrating to use at times, leading to a number of third party search tools designed for the site. At least now, the search box is easy to find, though I think it could do with more options, such as the ability to filter and sort search results by relevance and date to avoid the need to scroll down huge lists of Tweets. Earlier this month I opened CREATE 2009, a forum for academics and practitioners to share creative and innovative ideas for human computer interaction (HCI). The conference’s theme was ‘Creative inventions and innovations for everyday HCI’ so to start things off I outlined my four step approach to help designers find more creative solutions to their problems. The social media paradox: success & time. Successful social media engagement for online businesses requires a lot of creative thinking, time and effort. Initially, the balance is tipped in favour of hard graft, dedication and eureka ideas and then you start to see some results. Better results and more followers means more time required to interact effectively with them. A slippery slope or a stairway to heaven? Should we be spending all this time in the social web? Or is it time to take a step back and put the social media hype into perspective?